The Pentagon Memorial is much more than just a place of recollection - it’s a symbol of America’s suffering at the hands of terror. Explore some interesting facts about Pentagon Memorial. Though the topic of 9/11 always brings back the memories of the twin towers collapsing, there were other attacks that happened on the same day that were as catastrophic and devastating as that one. The alleged attack on the U.S Capitol in Washington D.C was foiled by the passengers, who tried to regain control of the flight from the hijackers, but unfortunately the flight crashed into a field near Shanksville in rural Pennsylvania. American Airlines Flight 77 and Pentagon were destined to meet. The flight from Washington Dulles International Airport to Los Angeles International Airport was hijacked by five Islamic extremists less than 35 minutes into the air and then deliberately crashed into the western side of the Pentagon at 09:37am EDT. All 64 people on board and 125 people inside the building were killed during the crash. The Pentagon memorial, in the premises of Pentagon in Arlington County, Virginia, is a monument for the 184 victims, who died in this attack. We have listed a few interesting facts about the memorial below. Right after the 9/11 attacks, an off the cuff memorial was set up on a hill at the Navy Annex overlooking the Pentagon. This was visited by people who paid respect to the victims. 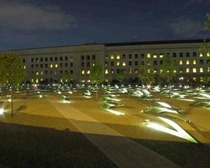 On October 11, 2001, a memorial service was held at the Pentagon for the employees and family members. This service was attended by more than 25, 000 people and President Bush spoke on this occasion. In a famous quote, Bush said ”The wound to this building will not be forgotten, but it will be repaired. Brick by brick, we will quickly rebuild the Pentagon." A remark which pointed to the repercussion that ended Al Qaeda’s regime in Afghanistan. Inside the Pentagon, at the point of Flight 77’s impact, the America's Heroes Memorial and chapel are located. They were opened in September 2002. A design competition was held to choose the design for the memorial. It was won by Beckman and Kaseman from Philadelphia, Pennsylvania. The memorial consists of 184 memorial units; each unit is dedicated to an individual victim by its unique placement within the landscaped 1.93-acre plot. The ‘terrazzo’ finish of each memorial unit rises dramatically from the ground on one end and the other end hovers over a small pool of lighted water in the surrounding gravel field of the park. Each bench has a name belonging to one of the victims engraved on it. The cantilevered benches are arranged in accordance with the age of the victims, starting from the three-year-old Dana Falkenberg, to the oldest, 71-year-old John D.Yamnicky. 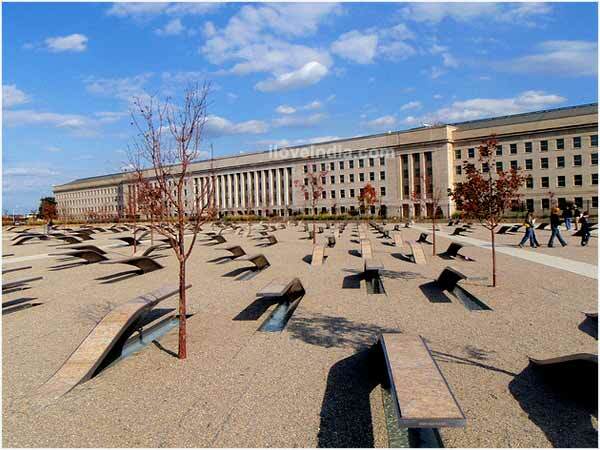 The benches representing the victims who were inside the Pentagon are arranged in such a way that those reading their names would be facing the Pentagon's south facade, the plane’s point of impact; while the benches dedicated to victims aboard the plane are arranged in a manner by which those reading their engraved names will be facing skyward along the plane’s approach. 85 paperback maple trees were also planted in the memorial site. 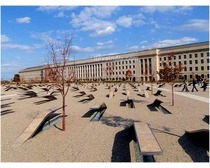 The Pentagon Memorial Fund, Inc. was setup in May 2003 to generate the 32 million dollars required for the memorial’s construction and upkeep. Out of the donations received for the memorial, 250,000 came from the American Forests and a million dollars from the government of Taiwan. The memorial termed as “an everlasting tribute to the 184 souls who perished” was dedicated to the nation on September 11, 2008 by President George W Bush. The memorial is protected by the United States Pentagon Police. The memorial is open 24 hours, 7 days a week throughout the year with support staff on hand from 10 a.m. to 8 p.m. EST. Photography is strictly prohibited everywhere on the Pentagon Reservation, except for inside the memorial.